Well, it’s not a robot, but it’s a curious vacuum cleaner, and seeing as how the Dyson robot vacuum cleaner (the DC06) has yet to appear, maybe now that there’s a really tiny Dyson, the DC06 is closer to becoming a reality? The DC26 is the smallest and lightest Dyson ever created, and I guess that’s saying something because the company has a reputation for building huge vacuum cleaners. According to Dyson it was designed with Japanese homes in mind, and is a snap to maneuver and operate. Obviously, this would also be a great gadget for hip city people who live in apartments or condos, because it won’t take up much storage. This tiny vacuum uses Dyson’s patented Root Cyclone technology, which has been proven to be better at sucking up dust than any other vacuum. Root Cyclone technology is what makes Dyson vacuum cleaners so effective. Unlike conventional vacuums which use bags, the Root Technology uses several levels of centrifugal force to spin dust, dirt, hair and debris out of the air. as a result, they don’t loose suction as a result of the bag (or filter) filling up. The DC26 also features the new V-Ball technology which makes for smooth rolling, easy maneuvering, and also helps keep the cleaner head at the ideal height from the floor to optimize suction. This vacuum cleaner won the Japanese 2009 Good Design Awards Gold Award in the Living category. The cleaner weighs a little more than seven and a half pounds, and will fit in a space the size of an A4 sheet of paper. The exact dimensions are: Width 320 mm — Height 266 mm — Depth 205 mm. Apparently, it’s also amazingly durable, having survived being dropped on a hard floor over 5000 times (presumably from more than a few inches) and also being banged against a wall 10,000 times. That’s quite a bit of abuse. 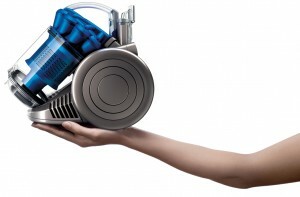 The Dyson City DC 26 is already available in Japan and will be sold in the U.K. soon. The U.K. price will be the equivalent of around $400. 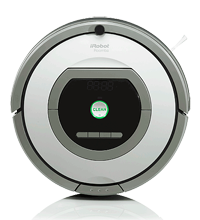 I won’t be buying this one, but feel the need to repeat that I’m really dreaming of one of these powered by a robot. Yeah! Let’s go Dyson robot vacuum cleaner!